The Royal Borough of Kensington & Chelsea (RBKC) used to offer motorcyclists free parking everywhere in their district, which covers the Western part of Central London. But some time ago, in a pure attempt to fill up their coffers in the long term, the council decided to charge their resident motorcyclists for parking, by introducing bays fitted with ground anchors, specifically reserved for residents. 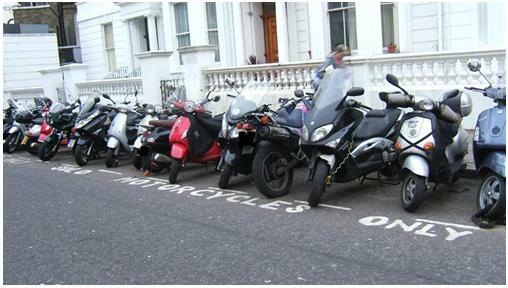 The RBKC used to have 1,590 spaces for motorcycles, all free of charge for everyone, whether residents or visitors. They subsequently installed ground anchors on 960 of those spaces and made them available for use to their residents only, subject to purchasing a parking permit. The remaining 630 parking spaces continued to be free of charge and were to be used by visitors. However, residents, who did not wish to pay for parking, were also welcome to use these remaining 630 spaces free of charge. Over the months, the RBKC created an additional 588 free spaces dedicated to visitors, thus bringing the total number of spaces in the borough to 2,178, of which 960 were for residents only (subject to purchase of a parking permit) and 1,218 for visitors, free of charge. There would have been no issues if the residents of the RBKC were happy to pay for parking their bike in bays equipped with ground anchors and, as a result, were letting visitors use the remaining 1,218 free spaces. However, a problem occurred when RBKC residents started to use the 1,218 free spaces to park their bike because they were not happy with being charged for parking in one of the 960 spaces dedicated to them. Because the free visitor parking bays were full of bikes owned by residents who were unwilling to pay for their parking, a large number of visitors could no longer park their machines close to their destination and ended up having to ride around for at least 20 minutes before they were able to find a space to park their bike. And if that space was located within 5 minutes walk to their destination, they were very lucky. So you see the problem? The 960 resident spaces are almost constantly left unused and the bays where the other 1,218 visitor spaces are, are constantly over-crowded, to the extent that, when you are lucky to find a space to park your bike, it gets damaged by another biker trying to squeeze their motorcycle into a tiny space, or you end up parking miles away and walk back to your destination. The whole situation is getting completely ridiculous. Not to mention the number of PCNs that must be issued to bikers on a daily basis because they have no choice but park their motorcycle illegally, when they can’t find a space in over-crowded visitor bays. The RBKC have so far addressed the problem by only creating a symbolic 150 extra free spaces (supposed to be for visitors), but what is actually required is convert the residents parking bays back into visitor ones, so that everyone benefits from 2,328 free spaces in total, and not just 1,368 (1,218 + 150). This is the solution to the problem but when are the RBKC going to understand this, given the increasing number of complaints that they receive from bikers? Perhaps, the only way to make the RBKC realise that there is a serious issue with motorcycle parking in their borough is by getting thousands of bikers from the No To Bike Parking Tax campaign turning up at their doorstep to demand additional free parking and the scrapping of their highly unpopular residents motorcycle parking scheme? Westminster City Council have seen thousands of bikers protesting in their streets and at their doorstep for the last 16 months to get their ridiculous motorcycle parking tax scrapped, so a bit of this thrown at the face of the RBKC may wake them up and force them to sort out their motorcycle parking policy. All this is very true. It is a real pain to find a space to park a motorcycle in Kensington & Chelsea, all this because the council wants to make money out of residents. I am a resident in Kensington and Chelsea. I am one of the bikers who refuse to pay to park because the use of bikes should be encouraged as they relieve congestion. I park in visitor bays, sorry guys! I have written to the council many times and they keep telling me the same spin, which is that they will be looking into the matter. But how long more are we going to wait until they finally do something about it? I too live in Chelsea and find the security devices in the resident bays complete rubbish. They get dirty and wet and when you touch them they make your hands dirty too. Also, they force you to carry a chain, which I don’t like. I don’t want to pay to use this rubbish, so I park in visitor bays free of charge. I don’t understand the logic of this council. Can’t they see that their resident bays are empty all the time and no one wants to use them? What a waste of kerb space, honestly! Kensington and Chelsea should make all motorcycle bays free of charge again. 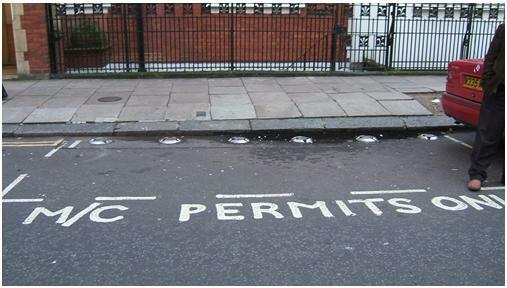 It would be easy to implement, all they would need to do is change the paint on the motorcycle bays from ‘Motorcycle Permits Only’ to ‘Solo Motorcycles Only’ (K&C don’t even have signs in the bays like Westminster). They can leave the ground anchors in place. I do think the ground anchors are a good idea (even if the majority of bikes don’t use them) because at least it gives bikers the choice to secure their bikes if they wish. I agree with the comment by Teresa though, the ground anchors are filthy, probably because they are in the gutter, but I think the council could clean them occasionally. The Royal Borough of Kensington & Chelsea residents are obviously unhappy to pay to park their motorbikes and scooters (as the residents motorcycle parking bays are always empty) so the only solution to this problem is to scrap the residents motorcycle bays and just have the standard free motorcycle bays. If Kensington & Chelsea converted all the residents bays to normal free bays, they would have 2328 motorcycle spaces (by their calculations). Come on RBKC, do the right thing! Are these resident motorcycle parking bays legal? Surely there should be a sign on a pole stating that the motorcycle bays are for permit holders only. I thought the only places on the road that didn’t need signs were double yellow lines. I bet Kensington & Chelsea have done very well from all the parking tickets they must have issued. Could it be that Kensington & Chelsea are awaiting the outcome of the various challenges to the Westminster scheme before (if WCC get away with it) either following suit or making the current residents’ bays into combined residents / pay-by-phone bays? Or is that too cynical a view? Get some ‘Surveyor’s Paint’ and spray out the word ‘PERMIT’. Park your ‘bike there and take a photo with your bike’s registration mark visible and the illegible signing. 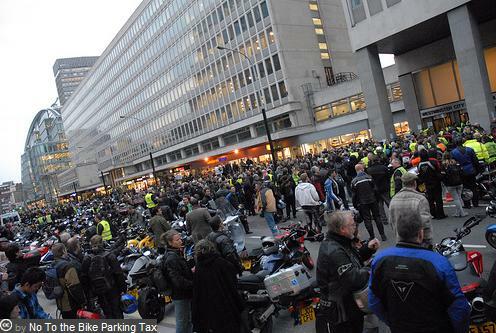 « Will Westminster City Council ever understand motorcycling?